Anabel Hernández will stop at nothing in search of the truth. Her investigative journalism on Mexican drug trafficking, alleged collusion of government officials and drug lords, and the Mexican government’s abuse of power has put her life in danger. After the publication of her first book, Narcoland: The Mexican Drug Lords and their Godfathers, she received multiple death threats and moved to California. After investigating the deadly night of a 2014 mass kidnapping and writing A Massacre in Mexico: The True Story Behind the Missing Forty-Three Students (first published in Spanish in 2016; translated in 2018), Hernández now lives in Europe in exile. On September 26, 2014, law enforcement officials in the state of Guerrero, Mexico, allegedly murdered six people and disappeared 43 male students from the Raúl Isidro Burgos Normal Rural school in the small community of Ayotzinapa. This catastrophic case would soon be known and referred to as “Ayotzinapa 43.” The normalistas never would have expected that soon after they commandeered multiple buses to travel to Mexico City–for a protest meant to commemorate the anniversary of the 1968 Tlatelolco Massacre—their lives would change forever. Since 2014, nobody has been held responsible for the violence inflicted on the 43 Ayotzinapa students, but Hernández, recipient of the 2019 Deutsche Welle Freedom of Speech Award, continues to dig deeper into what really happened that night. We spoke to Hernández, over the phone, about A Massacre in Mexico, her upcoming conversation about the 43 Ayotzinapa students at the L.A. Times Festival of Books, and the crucial role journalists play in holding those in power accountable. Your book A Massacre in Mexico: The True Story Behind the Missing Forty-Three Students was first published in Spanish back in 2016, two years after the 2014 disappearance of the 43 students of Ayotzinapa. Were you always planning on writing a book about your investigation? Since the beginning I was planning on publishing this book…I was publishing articles [about the Ayotzinapa 43] in newspapers and magazines [and] I understood that it was a very small space to try to explain a very complicated case. I felt that the only way to try and deeply explain and to depict all the difficult parts for people to understand what really happened that night was [writing] the book. Now you see Netflix and other outlets have produced a couple of documentaries about the case of the 43 [students] and in many, or all of the documentaries, they reached out to interview me because my research is so resonant to the case. But I don’t know how to do documentaries. Again, my best way to try to explain the case is through a book. This weekend, you’ll be at the Los Angeles Times Festival of Books to talk about your work. What do you want the L.A. community to learn or walk away with in regards to the case of the 43 students of Ayotzinapa? It’s very important that not just the Mexican society but also the international community and the big community of Latinos in Los Angeles try to understand that the case of the 43 is not just about the case of the 43 missing students. This case is a model of how the Mexican government violates the human rights of Mexican citizens using the corrupted army, using the corrupted police, and covers the crimes of the state. With this case, yes you can just talk about the students, but if you dig deep, you can see that it’s about more than that. It’s about all the people that have been murdered in this absurd, unjust, and supposed war against drugs that has only resulted in more violence in Mexico and more innocent victims. For example, the case of the 43 students is bigger. This case is about how the army, the federal police, and the federal government had been protecting organized crime in different parts of Mexico–and how in trying to protect [these organized crimes] they sacrificed these 43 students and tried to cover up what really happened that night. In my book and in this presentation [at the Festival of Books], the story I want to tell and the story that I want to explain is what really happened that night, and why that night is crucial in this story of Mexico’s recent history. It’s been nearly five years since the disappearance of the 43 students from Ayotzinapa. Now with the former president of Mexico, Enrique Peña Nieto, out and with Andrés Manuel López Obrador in his place, and expressing an interest in re-examining what happened that night–do you think anything positive or the truth will come out of his efforts? The new president, he just promised amnesty for all the corrupted [groups] and [promised] that he would not prosecute any more cartels and that he doesn’t, in his words, “want any revenge.” But this is not about revenge, this is not just [a matter] of prosecuting the cartels just because the government wants to, but because there’s a reason for the legality of justice… and I can tell you this, the truth is there. The government [behind] Enrique Peña Nieto tried to destroy all the evidence [from the night the 43 students disappeared], they tried to cover the truth but despite their efforts, the truth is still there. Many testimonies exist and there are many witnesses and I’m sure if the new government really wanted to resolve the case [of the missing 43] and find where the students are–they are able to do it. I also trust in the families of the students that they will not stop fighting and asking [the government] for justice. I have trust in the National Human Rights Commission that also still want to collaborate with the new government. I trust, for example, Deputy Secretary Alejandro Encinas, who is the head of AMLO’s truth and justice commission, but I don’t really see and I don’t really feel that this case is a priority for AMLO. Mexico is one of the world’s most dangerous places to be a journalist. As an investigative journalist who has taken on powerful institutions in your reporting, what would you say to U.S.-based journalists tackling the Trump administration? In the past few years of my career, I [started] to really understand that in countries like Mexico or the United States where economic and political power is so concentrated in a few people, journalists are the only ones who can hold these people accountable. These people won’t hold themselves accountable, it’s the free press that has the power to hold them accountable and show the people and the rest of society what they’re doing, how they’re making decisions, and why they’re making those decisions and so the rest of society and the community can come to their own conclusions and be free to make [further] decisions. If the people, whether in Mexico or the U.S., don’t have the truth or necessary information–they are not free. They are not free to understand. It’s crucial, I think, more than ever for journalists… we have to do this job even if the situation is hard, even if the power feels uncomfortable, even if those in power attack us. We have to do the work with more accuracy and profundity. 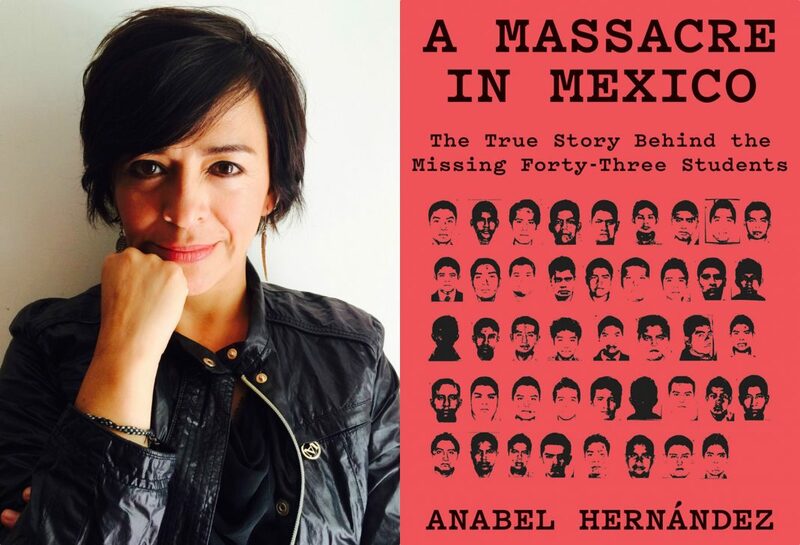 Anabel Hernández will be at the L.A. Times Festival of Books on Saturday, April 13, from 4:45 p.m. to 5:30 p.m. to discuss her book A Massacre in Mexico: The True Story Behind the Missing Forty-Three Students.